This book brings to light the extent to which the Jim Crow laws were in fact part of a totalitarian system of government that ruled the South for more than seventy five years. How these laws came to be called Jim Crow by historians instead of “a system of racist oppression and exploitation” is a mystery. The fact that historians and school textbook writers adopted this term,which is derogatory in its basis, points to a shameful lack of focus on the facts of life in the South during the period between 1876 and roughly 1965. Worse it aided the systematic cover up of the actual functions of these laws and their impact on African-Americans. If the word Apartheid had been invented earlier this would also be a useful term. The research and the writing is compelling. 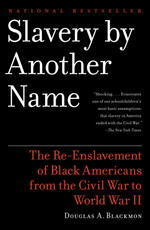 Blackmon has a website devoted to the book and the production of a documentary movie on PBS that will air in 2011.